My god, Titus Andronicus. Points for volume and creativity. 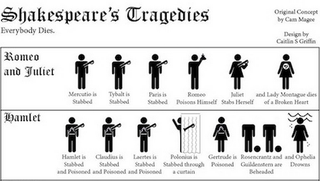 Cam Magee and Caitlin S. Griffin created a infographic that crosses Shakespeare with the people from bathroom signs. It shows every death from the tragedies, plus one of the most famous stage directions ever, from The Winter's Tale: "Exit, pursued by a bear."